Leading global manufacturer of biscuits and confectionery, Plaids on Tuesday in Lagos unveiled a promotional campaign to reward its loyal consumers as the brand celebrates 125th Anniversary of its famously loved McVitie’s Digestive biscuits. Pladis, home to iconic brands such as McVitie’s, Godiva, Haansbro, and Ulker launched a grand promotional campaign in celebration of the 125th Anniversary of its famously loved McVitie’s Digestive biscuits. The promo which will run for three months, starting from July 4, 2017, will reward winning consumers with prizes: N1 million each for three consumers; N500,000 each for six consumers; N200,000 each for 15 consumers and instant airtime for 45,000 consumers. 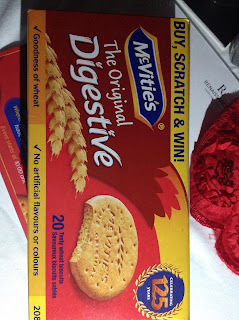 Country Manager, Pladis Nigeria, Mr Kwame Wiafe said the McVitie’s Digestive 125th Anniversary promo was specially packaged to celebrate a brand that had stood a test of time. He said the anniversary was being marked by rewarding consumers who had made the success story a reality. “The McVitie’s Digestive brand has enjoyed a lot of consumer love and support for over twelve decades across the globe, including Nigeria. We, therefore, decided to commemorate this great milestone by rewarding the very people who have made the McVitie’s Digestive brand story a successful one. That is, our loyal consumers,” Wiafe stated. Marketing Director, Pladis Nigeria, Mrs Toyin Nnodi who described the McVitie’s Digestive as a brand that not only touches royalty but a part of royalty said all prizes won will be mutually exclusive to the consumers. She said this was necessary to give all consumers the equal chance of winning during the promo. She expressed the commitment of the management to continue upholding the brand’s value of enriching consumers with happiness and deliciousness with every bite of McVitie’s Digestive biscuits.